As we toured the Mojave Desert section of Historic Route 66 (west to east) there wasn’t much left to see: a few relics worthy of a photograph but mostly dilapidated ruins usually behind chain-link fences and in a few cases not even a trace of the town. Surprisingly, our final stop, the town of Goffs, California, population 23, is alive and well. 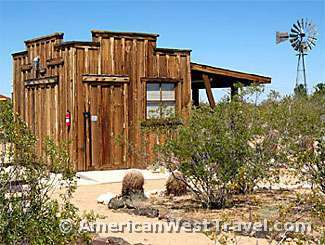 Years of efforts by Mojave Desert historian and enthusiast, Dennis Casebier, have created a well-kept and fascinating historical center in this remote outpost, known as the Goffs Cultural Center. 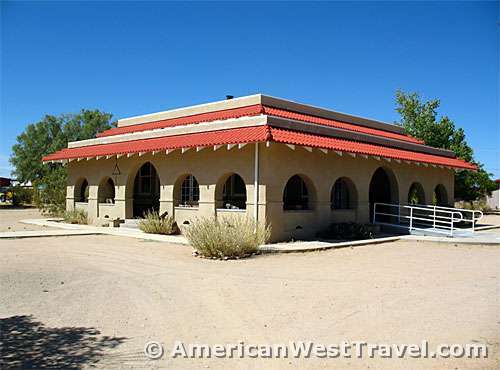 Over the years, his organization, the Mojave Desert and Cultural Association, has raised substantial funds to refurbish the historic Goffs Schoolhouse to its original 1914 condition and to build a library with thousands of volumes about the Mojave Desert and its history (in a standalone building modeled after the original Santa Fe Rail Deport). 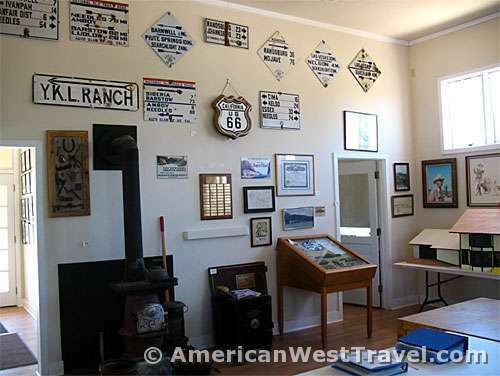 The schoolhouse is now a museum with many fascinating photos, artifacts, and exhibits. The center also offers an outdoor museum with plentiful relics from early mining and farming activities. There is also a nature trail. Goffs was originally started as a siding for the Santa Fe Railroad in 1883. The one-room schoolhouse was also used for community activities. A second smaller room housed the library. The wagon road following the railroad line became the National Old Trails Road before 1920, and officially Route 66 in 1926. At the time, Goffs was a major highway stop. However Route 66 was aligned six miles away in 1931 and the town started its decline. The beautiful schoolhouse was shut down in 1937. During World War II, many soldiers took desert training in the area, and the school became a café for the troops. Over the years, Goffs has remained largely a ghost, with only a service station and café operating occasionally. The schoolhouse fell into almost complete ruin. However the Casebiers acquired the property in 1990, and over the past twenty years have created and run this outstanding cultural center. In 1998, the schoolhouse was fully restored, and the Goffs Library was dedicated in 2008. The Schoolhouse and Cultural Center is located just north off of Route 66, on Lanfair Road. Look for the sign “Study the Past” (photo, above). They do not have regular visiting hours due to limited staff availability, but are happy to open the Schoolhouse and Cultural Center to visitors by pre-arrangement. Please call 760-733-4482 to schedule a visit. For more information, please visit the Mojave Desert Heritage & Cultural Association’s website. Route 66 Historic Attraction (Top Right). GOFFS SCHOOLHOUSE, ESSEX CALIFORNIA. 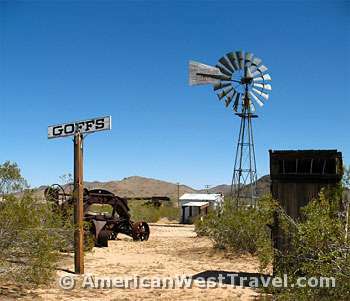 The Goffs Schoolhouse served this highway, railway, ranching, and mining community from 1914 to 1937. It was restored in 1998 and is now listed on the National Historic Register. Recognized by the Hampton Hotels Save-a-Landmark Program as a site worth seeing. Goffs Schoolhouse, 1914 (Top Left). The first school in Goffs opened its doors for the fall term in 1911 serving the needs of cattle ranches, mining, districts, homesteaders, the railroad, and, most of all, the people supporting expanding travel on the National Old Trails Road – later U.S. Highway 66. A new school, featuring a distinctive mission style, was designed by architect A. Beimer in 1914 and constructed by Tom Ware on land donated by H. P. Ware. The new school house was a source of pride for the community. It served their needs for a community center as well as a school until the spring of 1937 after U.S. Highway 66 was realigned and other factors diminished the population. It reverted to private ownership in 1938, and became a private residence until 1954. During World War II it was in the midst of a large desert training center army camp – there being more than 10,000 soldiers here at some times. From 1954 to 1982 the building was abandoned. In 1982 Jim and Berth Wold acquired the property and started restoration. In 1990 further restoration by the Friends of the Mojave Road began. Placed by the Billy Holcomb Chapter of the Ancient and Honorable Order of E. Clampus Vitus and Friends of the Mojave Road. October 13, 1991. Pah-Ute Creek and Fort Pah-Ute Mojave Road (Bottom Right). Pah-Ute Creek which runs year around, attracted many Indian tribes, who used several Indian trails through the area. The first white man to visit Pah-Ute Creek was Fr. Francisco Garces in May of 1976. It was given its name by Lt. A.W. Whipple during his Pacific Railroad Expedition of 1854. The War Department ordered, in 1857, that the Mojave Indian Trail be used as a wagon road from the Colorado River to the Pacific Ocean. It became known as the Mojave Road. 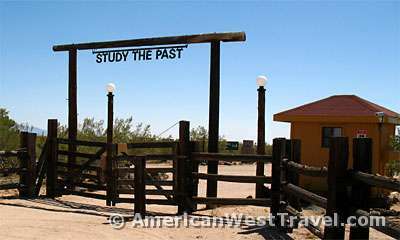 Fort Pah-Ute was established at this location for the protection of travelers and the U.S. Mail over the Mojave Road. The outpost existed from November 27, 1867 to May 3, 1868 when it was ordered abandoned. The building was designed by Maj. General Irvin McDowell and Major Henry Robert. The fort was constructed by the men of Company D, 9th U.S. Infantry Regiment. Placed by the Billy Holcomb Chapter of the Ancient and Honorable Order of E. Clampus Vitus and Needles District of the Bureau of Land Management. October 14, 1990. Army Camp at Goffs Desert Training Center. California-Arizona Maneuver Area (Bottom Left). The U.S. Army maintained a camp at Goffs, 1942-1944. Goffs was an important railhead, supply point, hospital, and for three months in 1942 headquarters of the 7th Infantry Division. That unit went on to distinguish itself in combat in the Aleutians and at Kwajalein, Leyte, and Okinawa. This monument is dedicated to all the men and women in the U.S. Army who served here with a special salute to those who laid down their lives for their country. Plaque dedicated October 12, 2008 by the Billy Holcomb Chapter of the Ancient and Honorable Order of E. Clampus Vitus in cooperation with the Mojave Desert and Cultural Association.